As June continues on with a feeling of excitement, what would provide a better start to the summer months than a bright new smile? There is no better feeling than that of confidence, and AllDental Travel clinics can provide that, just in time for the beach trips and summer vacations. With our comprehensive smile makeover service, anyone can get rid of their apprehensions about their smile. 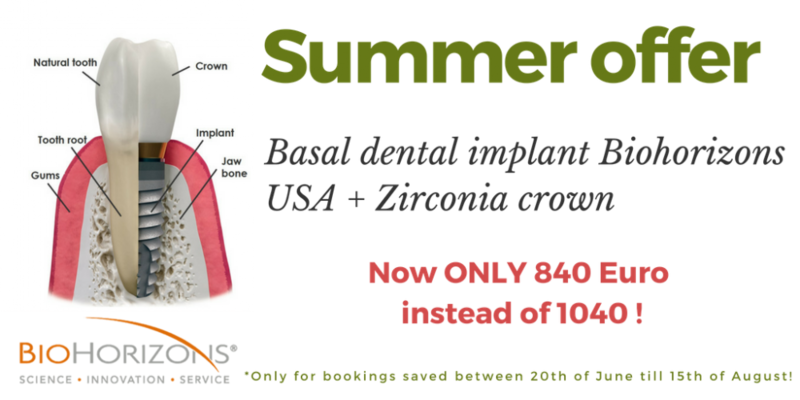 200 Euro off Basal dental implants* + Zirconia crown, plus FREE consultation, plus FREE transfers. The capacity during summer months is limited, so arrange the implantation a.s.a.p. Contact us for more information (info@alldentaltravel.com or call on +44 7883 173201). *Applicable to Biohorizons USA implants only. The procedure is quick and painless and does not involve sutures and bone grafting. The healing time is quick. The risk of infection is close to nil as long as you follow the post-operative management guidelines given by our specialists. The procedure comes with a special SUMMER OFFER with a great discount for our clinic in Sofia. This is a significant benefit as it is affordable to those in need of an excellent dental fixture. Dental tourism in Bulgaria makes this kind of discounts every season. Painless procedure – because of no incision and suture. The entire treatment is done in one week and in one visit. In normal dental implant procedures require multiple visits to the dental clinic for drilling, measurements, and surgeries over several months. We just need your panoramic X-ray and will go thru the process of making your bright smile. We provide FREE transfer services from Sofia airport to your hotel which we can also arrange for you, and FREE transfers to the clinic. Summer is the time of the year where the weather is nice, and everyone wants to go out and enjoy themselves. Don’t let your smile get in the way of having fun with your family, celebrating good times with your friends, or missing social events. Let AllDental Travel help you start the summer off on the right foot, feeling vibrant, confident and ready for any event that comes your way. Schedule your FREE consultation for affordable dental implants today by calling +44 7883 173201, and begin your summer with a beautiful new smile.